Big Leks is goin back through the classics of our youth. And I love it. Hopefully you all do too. So its my time to match and I figured Id spark it with nothin less than a super jam that we all can groove to. 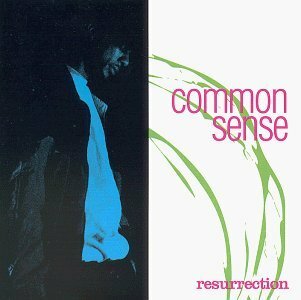 Resurrection is the title track off Common's '94 sophomore album. These were the good old days, back when Common was still Common Sense, Slick Wily Clinton was still jammin on his sax, and Biggie and Pac were both breathin. Its hard to believe that was more than 15 years ago, but I guess enough has changed since then to know its true. You just dont find masters of wordplay lacing jazzy beats like they used to. This is a special one though. From the get go its straight fire. His flow is the classic wind up and knockout. Each stanza begins tame enough, settin you up...then pow! He hits you with the punch line. And it sounds so good you almost dont even listen to the words, you just let it roll over you bobbin till the beat drops. But its the words that make this track a classic. Metaphors paint the details of the piece, adding that Common flavor to the piece. And Common is a master of metaphors. I put it at him, Eminem, Kwali, Black Thought, and Andre 3k as the best, but thats just a personal opinion (please hit us up with your favorites uses of wordplay!!!). Ill leave it at that. As always be sure to check the lyrics while you listen.